Koh-I-Noor Rapido Sketch Technical Pen- Size 1/.50 - Once used mainly by the graphic art industry, technical pens are making a cross over into fine art. Many of our customers have requested them for pointillism and detailed pen-and-ink artwork. Of course, they can still be used for graphic design as well! 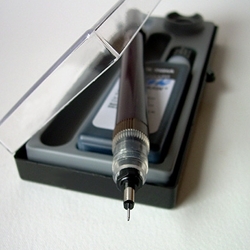 These pens use the refillable ink system (please click on the camera icon below to view one of the pens disassembled). The knibs are stainless steel. 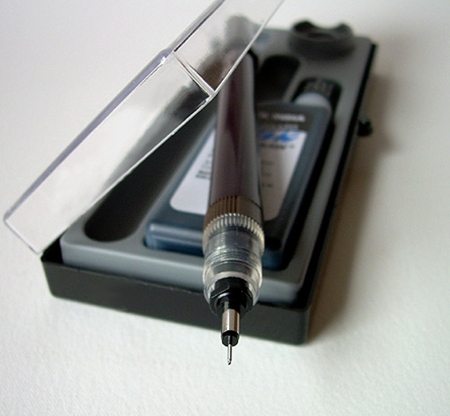 Each pen comes in a re-useable plastic box and includes a 3/4 ounce bottle of waterproof black ink. Technical pens require special care; the knibs MUST be flushed out with water after every use to ensure that the ink does not dry in the tip. The tips are very delicate; similar to an airbrush tip- they must not be dropped on the floor. Technical pens have to be held upright in order to get proper ink flow. Tipping the pen to the side while working will result in a broken line.